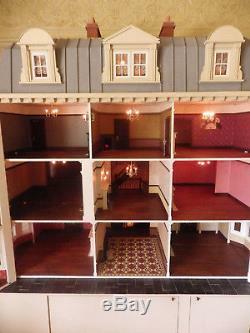 Anglia Dolls House by Tim & Angela Hartnell. These houses are very expensive and often there is a waiting list of 18 months to 2 years. At the time of building my house Tim didnt make stands so mine is just sitting on a baseboard that my husband made for me which you are welcome to have. The house is roughly the same size (slightly bigger) as the Anglia House called Lincoln Hall. My house has a much bigger basement as this is the favourite part of my house and collection. The last time I looked at Tims website my house was still featured in the bespoke section. I was terribly poorly at the beginning of the year and my husband said if I got better we would make our own dolls house - much smaller than my big Anglia house. 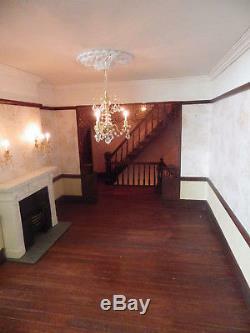 There are some pictures showing the house furnished just to give you an idea of size. 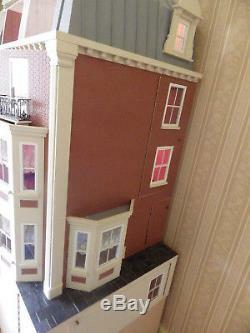 56 inches wide x 56 inches high (plus chimneys), basement 28 inches deep, house 25 inches deep. 1 full height balcony window to the music room - non opening and bespoke front door with brass fittings and an outside porch. 47 light fittings with approx 85 bulbs, 15 fireplaces and 2 ranges - one in the main kitchen and the other in the housekeepers room. The lighting is really easy to change via wire under the floorboards or down the chimney breasts in each of the rooms. 13 opening panels - 3 in the hipped mansard roof, 2 main front panels, 2 on either side of the house (4) and 4 in the basement. Room heigh is 10 inches in the basement, 2nd floor and mansard rooms, the two main floors have ceiling heights of 11 inches. I will add a picture with the individual room sizes in the photographs. Atisans represented in the house, Richard Stacey, Ray Storey, Small World Products, Rosel, Sussex crafts, Lucy Askew, Sue Cook, Hearth and Home, Les Chinnoiseries & Susan Bembridge, Malcolms Miniatures, Ann Maries miniatures Mike Tripp, Art of mini etc. The paint is Farrow and Ball and Little Green paint company. BASEMENT ROOMS - ceiling height is 10 inches in all the rooms on this floor. PANTRY with built in shelves (supports by Art of mini) Hearth and Home sink, Richard Stacey Flooring, SWP light fitting, Transom door to the hall which is 4 inches wide, this leads to a little downstairs loo, could also be used as a store or coal cupboard and access to the back hall with stairs up to the main floor. LAUNDREY with an open chimney breast for iron stove with shelf above, boiler made by Tim with Sussex crafts light box, Richard Stacey flooring, Heidi Ott lights, 2 double door laundry cupboards, transom door to hall. KITCHEN having 4 heidi Ott lights, Richard Stacey Marl flagstones, built in Sussex crafts bread oven, Hearth and Home Range, large window overlooking rear hall, transom doors to back and right side hallways. BUTLERS PANTRY with Richard Stacey flooring, 3arm SWP light fitting, door to hall and archway to WINE CELLAR - again with Richard Stacey flooring and 3 arm SWP light, the little shelf unit was made by Tim. HOUSEKEEPERS ROOM having a wood floor, built in cupboard (non opening) with shelves above, a range with SWP oil lamp on top and SWP light fitting, door to hall. MAIN FLOOR ceiling height 11 inches. The Back hall runs the full length of the house 48 inches long, 5 inches wide with a larger area (8 ins) for the main part to accomodate the stairs which run all the way up the back of the house. Double doors - each side to drawing and dining rooms. DINING ROOM Wood floor, working sash Bay windows both to the front and side of the house, sussex crafts fireplace and Ray Storey light fighting. Double doors leading to the rear hall. 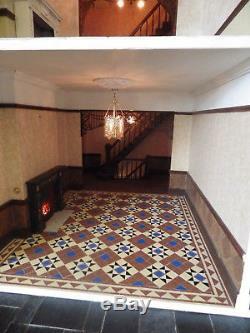 Main Hall individual hand laid minton floor tiles by Ann Maries miniatures, a beautiful Sue Cook fireplace, USA fretwork divider to back hall. Lincrusta style panel below dado rail, Light by Small World Products. DRAWING ROOM Wood floor, working sash bay windows to the front and side, Fireplace made by Chris Toogood, display shelves and cupboards (non opening) either side of the double doors, Ray Storey 5 arm light fitting. 1ST Floor ceiling height is 11 inches. 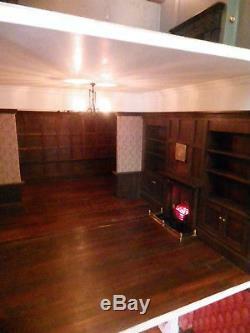 STUDY Panelled to dado height, bookshelves either side of the fireplace. OOAK built in Wall Safe by Mike Tripp of Ironworks & black country miniatures. Ray Storey Light Fitting, Bay Window to the front, large archway to the GUNROOM with full panelled wall, working fireplace, Ray Storey Light, working sash window, wood flooring, Les Chinoiserie wallpaper, door leading to hall. MUSIC ROOM with wood flooring, USA fretwork room divider to hall area, Heidi Ott Chandelier with two matching wall lights, Lucy Askew fireplace, non opening full length window overlooking the balcony. FAMILY PARLOUR with wood floor, bay window to the front, Ray Storey 3 arm gas light, white fireplace, large archaway leading to the FAMILY DINING ROOM again with white fireplace, Ray Storey Lights, working sash window and door to the main hall. 2nd FLOOR ceiling height is 10 inches. GENTLEMANS ROOMS - BEDROOM with wood floor, Sue Cook Fireplace, 3 arm SWP light with two matching wall sconces. Door to BATHROOM again with wood floor, corner fireplace, SWP light, opening panel with working sash window on the side of the house, door leading to the hall stairs and landing. The window has origional John Watkins'wrought iron' railings on the balcony on the front of the house. LADIES ROOMS - BOUDOIR (please note this was origionally two small bathrooms when I commissioned the house) Wood floor, Heidi Ott Chandelier, Phoenix grate with surround made by Tim, doors leading to the hall and LADIES BEDROOM with chandelier, fireplace, My fan collection is stuck to the wall (sorry) very pretty rose wall sconces and a double arch through to the DRESSING ROOM with wood floor and a small Rosel crystal light fitting, opening panel with sash window on the right of the house. 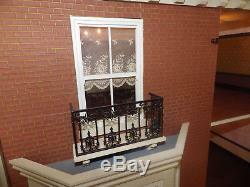 Again there is an origional John Watkins'wrought iron' metal balcony. 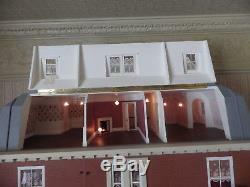 MANSARD ROOF NURSERY ATTIC ROOMS with three opening panels. On the left there is a NURSERY PLAYROOM with tongue and groove wall panels to dado height with Susan Bembridge'The Months' wallpaper, SWP pretty frilled glass ceiling light, Sue cook fireplace with a surround made by Tim, USA fretwork room divider to the NURSERY DINING ROOM again with a SWP light and decorated the same as the nursery. Doors to the hall on the right and small school room on the left with an opening panel on the side of the mansard roof. NANNYS BEDROOM with USA ceiling light and matching lamp, Sue Cook fire place with a surround made by Tim. 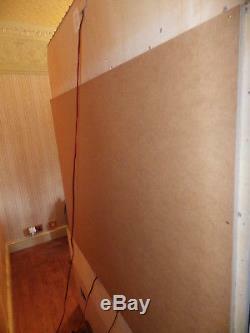 Door leading to rear landing and corridor to. NURSERY BEDROOM with Sue Cook Fireplace, again surround by Tim, SWP light fitting USA fretworkroom divider to the DRESSING AREA and an archway through to the TODDLERS BEDROOM with an opening panel on the side of the mansard roof. OUTSIDE the pavement area is slate by Richard Stacey. The lighting is on three seperate circuits, well labelled and one for each section, also a large capacity transformer for the large number of lights and fireplaces included in the sale. This is a big house and very very heavy, weighing in at over 230lbs, it comes in three sections, the basement, main house and mansard roof to help with transportation. I believe shipley courier is quite good. I can remove fireplaces, chimneys, bay windows and porch and wrap seperately to ensure safe passage. Please note this has been my pride and joy for a couple of years, there are tacky wax marks on the walls, once your pictures artwork and furniture are in place you wont notice this but I do like to mention it, it has been a loved and used house. This house will be listed elsewhere. I would prefer cash on collection, many thanks for taking the time to read through this very long listing. 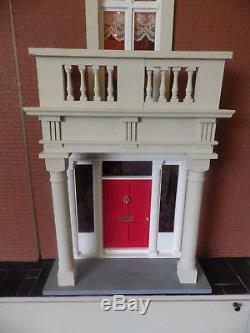 The item "Anglia Dolls house double fronted Victorian Villa. OOAK 28 rooms + hallways" is in sale since Wednesday, September 19, 2018. This item is in the category "Dolls & Bears\Dolls' Miniatures & Houses\Hand-Made Items". 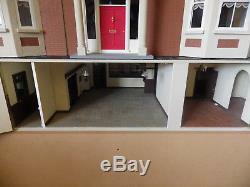 The seller is "christmasgirl25" and is located in Grimsby. This item can't be shipped, the buyer must pick up the item. 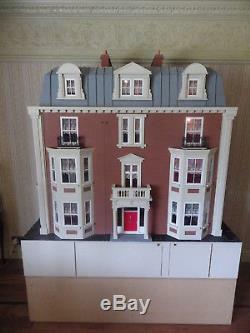 Bundle Description: anglia dolls house, richard stacey flooring, Ray Storey & others Lights, Sue Cook, Sussex crafts, hearth and home etc.